Musician Laurie Lewis talk East Bay's Bluegrass roots ahead of the festival. 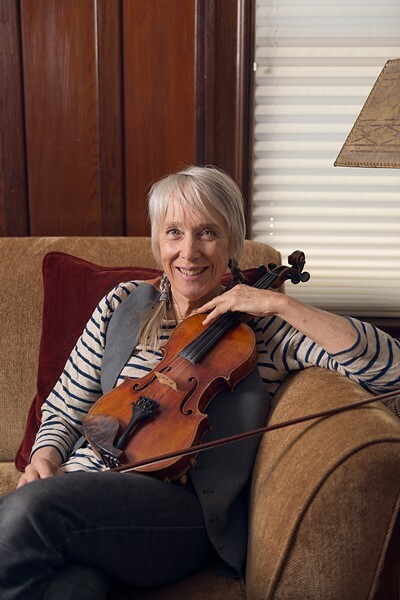 Bluegrass musician Laurie Lewis helps put together the Berkeley Bluegrass Festival. Since its early days in the late Sixties, Berkeley’s Freight & Salvage Coffeehouse has been a center for acoustic music of all kinds. While psychedelic bands in San Francisco created a new paradigm for rock, the Freight quietly redefined acoustic music, with a groundbreaking combination of blues, folk, country, international music, and bluegrass. Berkeley had been recognized as a bluegrass haven since the Fifties, but it was the Freight that gave that music, and the musicians who played it, a Northern California home. The venue’s open-door policy offered artists a chance to try out ideas, participate in night-long jam sessions, interact with each other and their audience, and sustain Berkeley’s ongoing love affair with bluegrass. The music heard at the Freight profoundly influenced her when she started playing fiddle. She was a founding member of the Good Ol’ Persons, possibly the first all-woman bluegrass band, and went on to win a Grammy for Best Bluegrass Album in 1997, for her work on True Life Blues: The Songs of Bill Monroe, an all-star celebration of Monroe’s life and music. “Playing the Freight every couple of months did wonders for the nuance of the music,” she said, adding that the coffeehouse’s dedication to folk and bluegrass was important to her development as an artist. When the Freight’s program director, Peter Williams, approached Lewis and asked her to help put together a Berkeley Bluegrass Festival, she quickly signed on. “Two years ago, when I heard the words ‘Berkeley Bluegrass Festival,’ I thought it had been going on for a long time,” she said. But this year’s is in fact only the second annual. Since moving to their new building in Berkeley’s downtown arts district in August 2009, the club has been booking more national acts. The larger venue came at a cost to local players, who once considered the Freight home, but often are unable to fill the larger venue. The Berkeley Bluegrass Festival is these musicians’ chance to share the stage with artists such as Robbie Fulks, The Lonely Heartstring Band, and Lewis & the Right Hands. “One of the ideas behind the festival was to have a time once a year we could get local bands on the stage and make a big thing of it,” Lewis said. By combining local and national acts, the club will be able to highlight the long, deep history of acoustic string-band music in the Bay Area. The lineup for this year’s edition runs the gamut from traditional bands to edgy modern groups, all with their own interesting, individual takes on bluegrass. Because women have been such an important part of the bluegrass scene in Berkeley, and the Bay Area in general, Lewis wanted a strong female presence for this second year. Women are present in Bean Creek, a band featuring singer and bass player Sarah Eblen; 35 Years of Trouble, a group of teen-aged virtuosos, includes fiddler Tessa Schwartz, 13, and multi-instrumentalist Helen Lude, 14; while The Lula Girls is an elite group of the Bay Area’s best women players, including Lewis, Mary Gibbons, Kathy Barwick, Sharon Gilchrist, Amy Scher, and Emily Mann. The festival will also honor the Freight’s freewheeling early days by offering free workshops. Players of all ages, and levels of proficiency, can get together with experts, and fellow pickers, to discover pointers on Dobro, harmony singing, bass, and square dancing, as well as an afternoon-long bluegrass jam session. Friday, May 19, through Sunday, May 21, three-day pass is $60, individual shows are $28-32, workshops are free. 2020 Addison St, Berkeley. TheFreight.org.